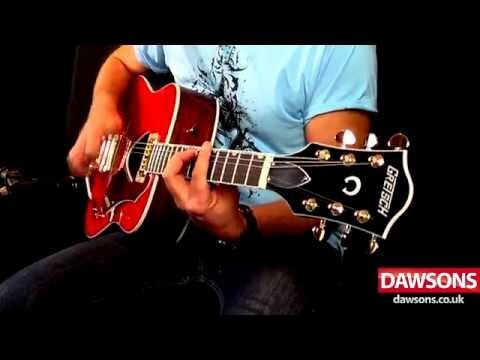 The Gretsch G5034TFT electro acoustic guitar perfectly exemplifies the style and tone that have made Gretsch guitars so beloved for generations. The powerful dreadnought body is crafted from a robust combination of laminated mahogany back and sides with an arched laminated maple top. The sonic texture produced by the gorgeous tonewood combo encompasses incredible power, with grace and articulation. The top features a warm Savannah Sunset finish, with gentle white binding around the edge of the top. The lower bout of the body is protected by a delightful tortoiseshell pickguard that carries the customary Gretsch logo. A solid mahogany neck is fitted to the body, providing a highly resonant support for the sumptuous rosewood fingerboard. Neo-classic thumbnail position inlays guide your way along the 16 vintage-style frets. A Fideli'Tron humbucking pickup is fitted at the base of the fingerboard - just above the triangular soundhole - to allow the most accurate and pristine amplification of the body as possible. The pickup is very simple controlled by a top mounted "G" arrow volume control knob, allowing you to simply boost the natural sound of the tonewoods, without colouring the sound. The gold-plated hardware offsets the Sunset body finish and the natural rosewood fingerboard perfectly. Deluxe die-cast tuning machines keep your strings perfectly in tune every time you play, the synthetic bone string nut ensures string action and tension is accurately maintained. The icing on the cake with regard to the G5034TFT lies in the bridge - a rosewood-based "rocking" bar bridge coupled with a Bigsby tailpiece with CA wire arm. Not only do the gold-plated bridge and tailpiece look absolutely stunning, but they enable you to have exceptional control over subtle creative nuances in your playing.